There are multiple socket types used in South Korea (A / B / C / F). Type A/B is the most commonly found so a UK 3 pin to type A/B adaptor should allow you to connect your appliances in many cases. If you want to be sure though a better option may be to invest in a worldwide adaptor that is a single unit capable of connecting to multiple socket types. Voltage - Multiple voltages are in use in South Korea . It is essential therefore that you check what the voltage is locally before you plug in an appliance. In some countries different sockets are used for the different voltages but this is not necessarily the case so always check first. 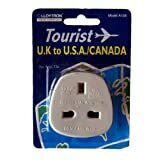 UK appliances will generally operate satisfactorily with a voltage anywhere in the range 220V - 250V. If the local voltage is in the range 100V - 127V you will need to check your appliance for compatibility. Some appliances are marked 100 - 240V either on the equipment itself or the power supply (if it has one). If it is not marked as able to accept the local voltage do not plug it in! In order to operate incompatible appliances you will need a transformer. Frequency - The frequency in South Korea is 60 Hz which is slightly higher than in the UK (which operates at 50 Hz). In practical terms this makes little difference as most travel appliances will run at either frequency. Some items with motors, such as hairdryers and some clocks will run a little faster than intended but it is not likely to be problematic. Check your device - it may say 50/60 Hz which indicates that it is compatible with either frequency. If you are in doubt or have expensive equipment check with the manufacturer first as some equipment may be damaged by running on an incorrect frequency. Special considerations - Type F is normally found in offices, airports, hotels and homes. Type C (type CEE 7/17) sockets are obsolete as of 2008 but still found in a lot of places. In cases where a Type C socket was replaced with a Type F, the ground contact is often not connected to anything. 220 volt power is distributed by using both "live" poles of a 110 volt system (neutral is not used). 110 V/60 Hz power with plugs A & B were previously used but has already been phased out. Some residents install their own step-down transformers and dedicated circuits, so that they can use 110 V appliances imported from Japan or North America. Most hotels only have 220 V outlets, but some hotels offer both 110 V (Type A or B) and 220 V (Type C or F) outlets. Switches and outlets fit American-sized boxes.